The Varvel Group has renewed its support for the 2017/2018 edition of Professional Datagest’s Masters Course in Racing Motorcycle Engineering. Our support for future talent in racing motorcycle design is becoming a permanent commitment. This year again, Varvel rewarded the most promising student in the Masters Course in Racing Motorcycle Engineering organised by Professional Datagest, the Bologna-based leaders in further education with whom we have been working for a number of years. The student who excelled above all others this year was Marco Forconi. 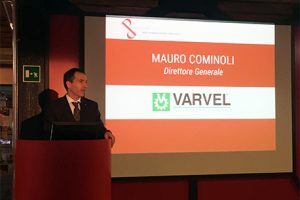 On Saturday 19 May, Varvel’s Managing Director, Mauro Cominoli presented Marco with a grant to help him pursue his dreams. Supporting excellence in education and helping tomorrow’s professionals to pursue personal and professional development are two of the activities that define Varvel as a socially responsible company.